As civil resistance movements across the world start shaking their way into global media consciousness, West Papua Media is one of the few independent media networks that have a head start on nurturing ‘witness journalism’. West Papua Media is a project that came into play to counter Indonesia’s foreign media ban, which was making it increasingly difficult for international news crews to get into West Papua to document events and abuses on the ground. 2011 has been an eventful and very busy year for both West Papua’s civil resistance and for West Papua Media. West Papua Media has continuously broken globally significant stories of resistance and survival in Papua during 2011, and has continued to provide effective monitoring capacity of civil resistance activities across Papua. 2011 was also the year in which West Papua Media has made Indonesia’s ban on foreign journalists largely redundant. 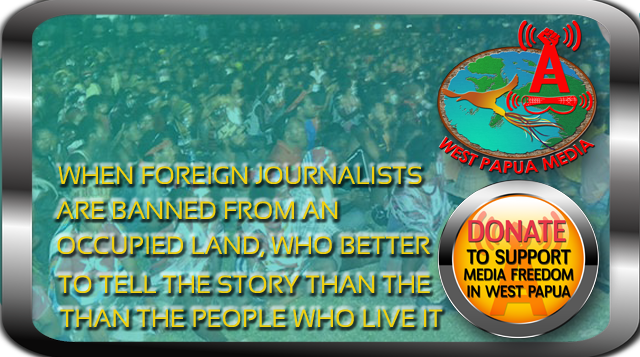 West Papua Media has been proudly working hard throughout 2011 to bring you the hidden stories from West Papua, and consistently bringing the proof of major security force abuses to the world’s attention through our factual and credible reportage process. We have increased significantly our unique investigative capacity and expanded our local networks of both citizen and professional journalists, human rights sources and videographers, and working closely with local indigenous media and human rights networks inside Papua, West Papua Media has been able to consistently provide exposure to both the burgeoning civil resistance movement, and to document Indonesian state abuses against civilians. We have expanded our reach significantly and gained tens of thousands of regular content viewers, growing to now become THE first source of information for international media and human rights networks to turn to when major events occur in West Papua – such as the Third Papuan People’s Congress of October 2011, at which Indonesian security forces attacked with live bullets, a peaceful gathering of West Papuan activists discussing their rights to self-determination. Our live and committed monitoring of civil resistance mobilisations (and of security force mobilisations) has now begun to be seen by others as a deciding factor in creating effective restraint, a restraint that has prevented security forces from behaving badly on many occasions during civil resistance situations. However, in those remote and dangerous areas where our teams have not been able to penetrate in real time, this has meant heinous abuses continue – something we need your help to prevent. West Papua Media was created in 2008 to close a critical information gap in coverage of the human catastrophe in West Papua. Long term human rights, environmental and human security investigators and journalists covering the Melanesian area were disturbed at the wilful ignorance of the Western media to the ongoing human rights abuses and corruption of the Indonesian occupation of West Papua. The mission of West Papua Media is simple: whilst reporting credibly on the issues facing West Papua today, we are here to assist in the development of a professional (unpaid at this stage unfortunately), robust, credible, and independent SAFE civil and investigative media capacity in West Papua. In short, Free Media for West Papua, helping the Voiceless Roar, with the skills to counter any attempt to silence that voice. We want to stop people from being afraid of speaking out, and we want West Papua’s voice to be its weapon, to broadcast its songs for Freedom. West Papua Media needs your help to grow, we need your help to be able to deliver Safe Witness Journalism Training to the people who need it the most – frontline journalists and human rights workers in highly dangerous situations regularly facing security force violence, corruption, or resource company abuses; in many cases these situations are further compounded by isolation and lack of safe communication potential. We need your help to be able to pay for our stringers to penetrate active military zones, with relative safety, to report on the significant human rights abuses occurring there. To get this to happen, West Papua Media requires assistance for major fundraising across 2012 to enable effective journalist training, and to sustain our unparalleled efforts for Independent Human Rights Journalism for West Papua. To plan our forthcoming work effectively, we need your support to gather funds quickly. HOW CAN YOU HELP BUILD A FREE MEDIA FOR WEST PAPUA? To help our work, we are asking for assistance from your or your organization, assistance that will play a strategic role in the future of a Free media in West Papua, and thereby contributing directly to the exposure and ultimate prevention of human rights abuses in our region. If required, for sponsorship above a certain value, we are happy to provide your organisation with a full rundown of West Papua Media’s plans and operations for 2012 and beyond. $3000 would provide communications support for five of our journalists and stringers on the ground for up to three months of intensive monitoring across civil resistance mobilisations. $2000 could provide the support for one journalist to enter into a closed military area to report on security force abuses, and bring the story to the world. $1000 could provide a netbook, a smartphone, 3g access, and a digital camera for one journalist on the ground in West Papua. $1000 could provide the West Papua Media Editorial team for communications costs for three months. Donations of $500 or more (for an organization) or $100 or more (for an individual) would be acknowledged on a new “Supporters” page at www.westpapuamedia.info depending on your choice. To make a donation, please visit https://westpapuamedia.info/donate-to-support-media-freedom-for-west-papua/ for a Secure Donation Facility (via Paypal), or please contact Nick on +61(0)450079106 or editor@westpapuamedia.info for bank details. Never before has there been such a simple and strategic opportunity to contribute to the freedom of a people, and build the fundamental foundation of a democratic society – a free media. Our vision is simple – to train and deploy an effective, empowered, robust and fearless civil media sector that involves the ordinary people to tell their stories. Please help us today so we can make the voice of West Papuans their most effective weapon. Australian Government should be assisting our own fellow Pacific Melanesian people of West Papua which is so close in proximity to us, rather than continuing to waste tax and revenue on Afghanistan etc. We need to get our priorities straight and focus our much needed attention on our own backyard and help West Papua to become free from Indonesian ruling. We let West Papua down before, so we need to help them now, before it is too late. we papua new guinea people they hear the broblem un much thing now anak wtspapua here living like PNG PEOPLE so, thing now more killing in wtspapua they gat go back to wtspapua because of to much killing like war in westpapua .